Charles Groesbeck - Warren Police Commissioner from 1977-1981 passed away last week. Charles Groesbeck, former Warren Police Commissioner passed away. Charles Groesbeck, former Warren Police Commissioner from 1977-1981, a member of Warren’s greatest generation passed away last week. 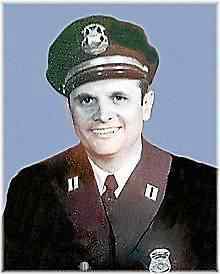 Charles Groesbeck, former Warren Police Commissioner from 1977-1981 passed away last week. He was appointed Police Commissioner by Mayor Bates in 1977. A member of Warren’s greatest generation who served valiantly in World War II. During his service he earned five medals including the American Medal Award. He served as a Warren Police officer from 1948 to 1981. He was the first Warren Police officer to be appointed to the FBI Academy in 1960. I spoke with his son Eugene last night and he said that everyone is sharing with him great stories about great things that his dad did. People really liked and admired his dad. He will be at Temrowski Funeral Home this Friday, October 6 from 3-9 PM. At 7PM the Warren Police Honor Guard will honor his service to the police department and eulogies will follow. On Saturday, October 7 at 11:15 AM, a mass will be held in his honor at St. Faustina Church, 14025 E. 12 Mile Road, Warren, with military honors to follow. Virtually everyone that I have spoken to about him have only had high praise for Commissioner Groesbeck. Some say he was Warren’s best top cop! He was 93 years old and had been married for over 70 years!